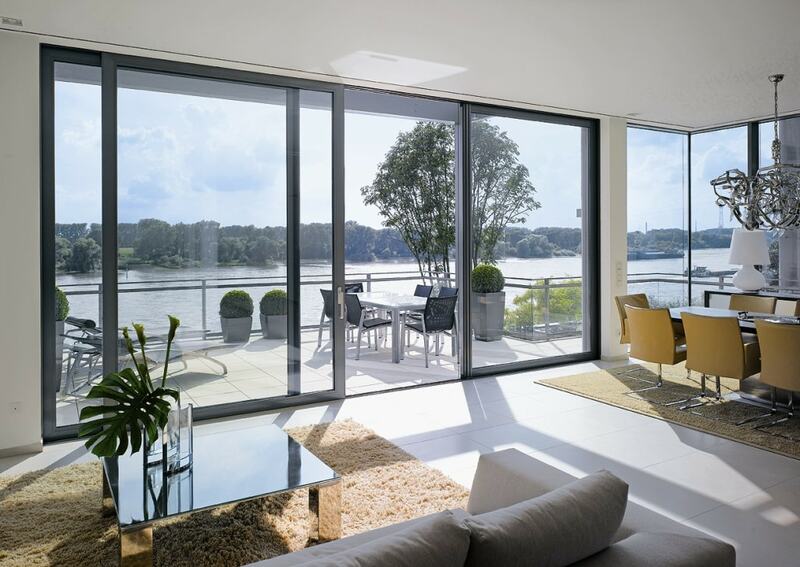 Our refined and contemporary sliding doors bring maximum daylight, allowing you to appreciate your outdoor space. The easy to operate sliding door takes up minimum space and defines your property as stylish and modern. You no longer have to use regular entrances, now you can dazzle your visitors with our cutting edge and deluxe doors. Efficient Insulators: Stay snuggled and cosy during the winter season, as our sliding doors are designed to encapsulate the warmth of your home as our frames are specially constructed with “thermal breaks.” You’ll no longer have to worry about drafts, as our specialists will prevent all possibility of the cold entering your home, ensuring that your home stays warm through the winter. Appealing to the eye: If they are installed properly, they can be an attractive feature to your home, making it appear more prosperous and inviting. By adding a glass entry to your wall, more natural light will be able to fill the room; Whereas regular entrances can often look bland and give your room a claustrophobic and box-room feel. Security: This new attraction is not only impressive to look at, but also secure and practical. Our sliding doors are fitted with toughened glass and internal beads to ensure your safety and security. In addition to this, our doors are also installed with a ‘Secure All’ multipoint locking system, guaranteeing that your property will be protected as this is key when having new doors installed into your home. Accessibility and Usability: Sliding doors also save you a lot of space in comparison to regular ones as they are installed onto rails. Our doors do not have an opening, unlike regular doors. Due to this, you’ll be able to design your interior without any restrictions and our sliding doors are fitted to make them user friendly. There is no heavy pushing or pulling action, just simply glide the doors along the rail to use. 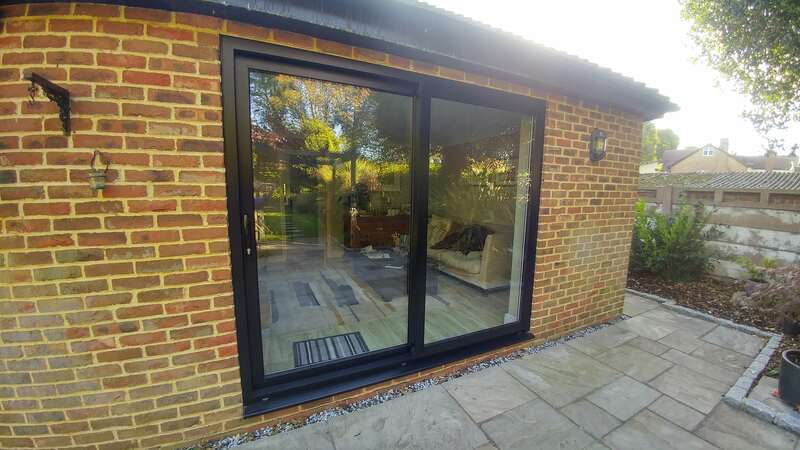 Our premium sliding doors will allocate a touch of class and sophistication to your home, whilst being efficient and practical for small living spaces. 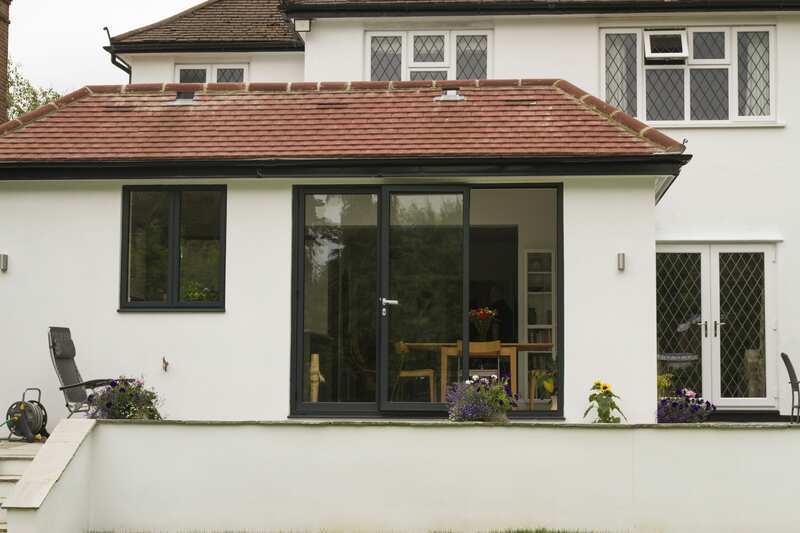 Here at Surbiton Glass, you can choose from a selection of bespoke patio sliding doors that are custom made to your requirements. 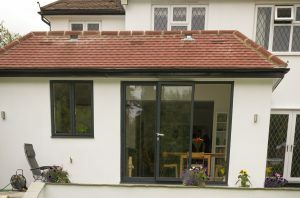 We offer expert advice as to which system would suit your particular situation. They are specifically installed by our specialists, eliminating all stress and bother on your behalf. 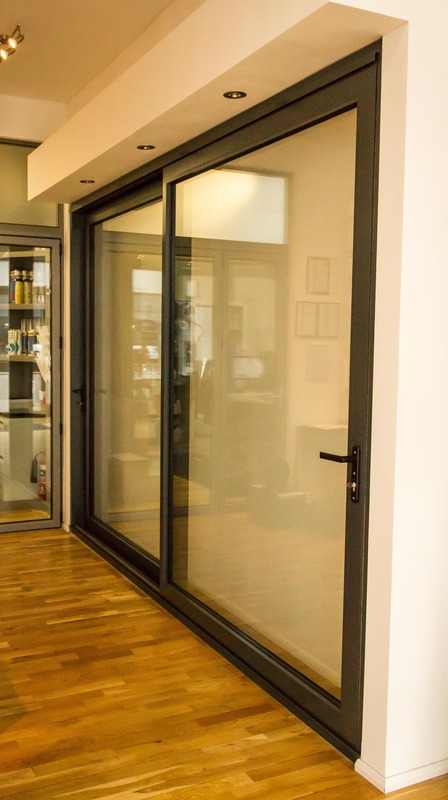 Our range of sliding doors are custom designed to suit your creative needs. There are over 180 colours available for you to choose from and they are exclusively tailored to fit your property just the way you like it. 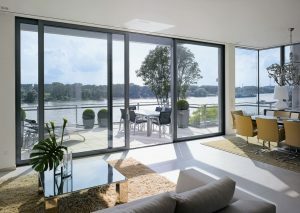 Sliding doors can be installed both internally and externally. 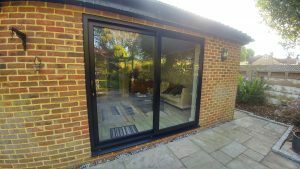 Although internal sliding doors are arguably easier to install, we still recommend using our services in order for it to be fitted successfully. If you are looking to install an external sliding door to open your garden, patio or balcony space, you will ultimately need help from our specialists. Our team will remove any confusion and stress from your behalf by professionally installing your bespoke sliding door system – quickly, carefully and effectively – ready for you to use in no time at all! Once this process is complete, you will be able to use your sliding door in the comfort of your home. The functionality of sliding doors is simple – the doors slide along a metal track which is fitted professionally into the top and bottom frames. The doors work by using the handle to slide along the track. They require little maintenance and are very easy to use, allowing for easy accessibility for each person who visits your house. Take full advantage of feeling comfortable in your home by purchasing our sliding doors today. At Surbiton Glass, our specialists will provide you with a first-class service that ensures you are happy with our deluxe sliding doors. It is our mission to guarantee you with a stunning and luxury outcome in your home. 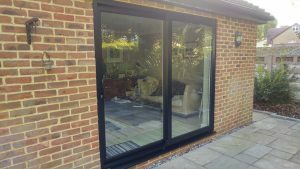 Enquire today to receive a free estimate on our page and you could get your sliding doors installed in no time. 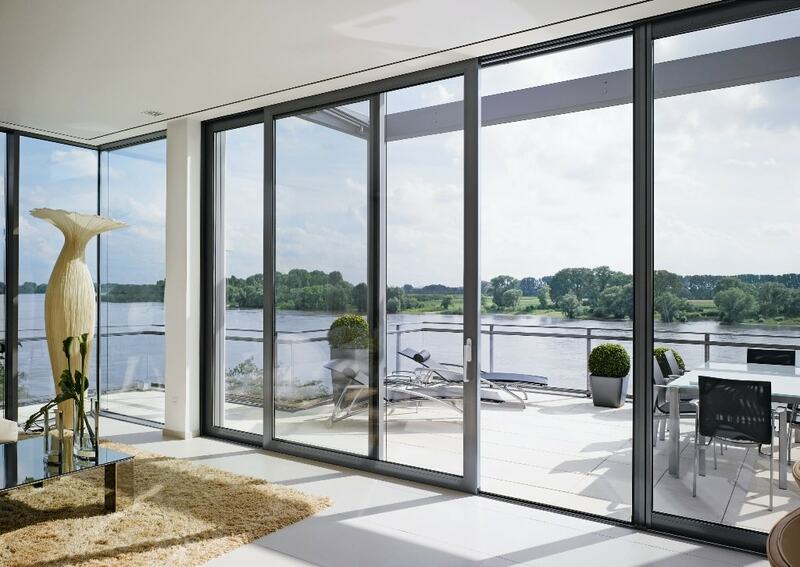 To discover our full range of sliding doors, and find out why we are the leading suppliers of sliding doors in London, please view our online brochure by clicking below.